This building is Manitoba’s foremost example of Prairie Style architecture and only known surviving example of Prairie Style institutional architecture in Manitoba. It was designed by Francis Conroy Sullivan (1882–1929), one of Canada’s pioneer practitioners of this style. His inspiration was Frank Lloyd Wright (1869–1959) the renowned Chicago architect and originator of the Prairie Style which achieved widespread acceptance from 1900–1914. 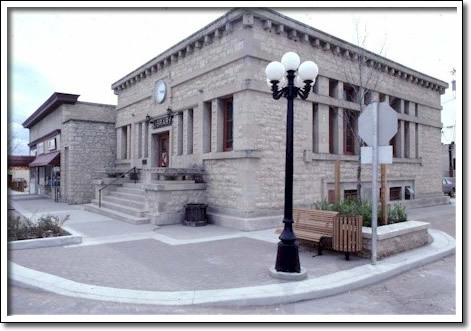 The Dominion Department of Public Works built the post office during 1914–15 using local Stonewall formation limestone. It was used as a post office until 1978.